The Jimmy Stewart Show wasn't a hit when it originally aired during the 1971-1972 television season and likely wouldn't perform well today, but classic film fans may enjoy watching this sitcom that features one of the silver screens greatest stars. 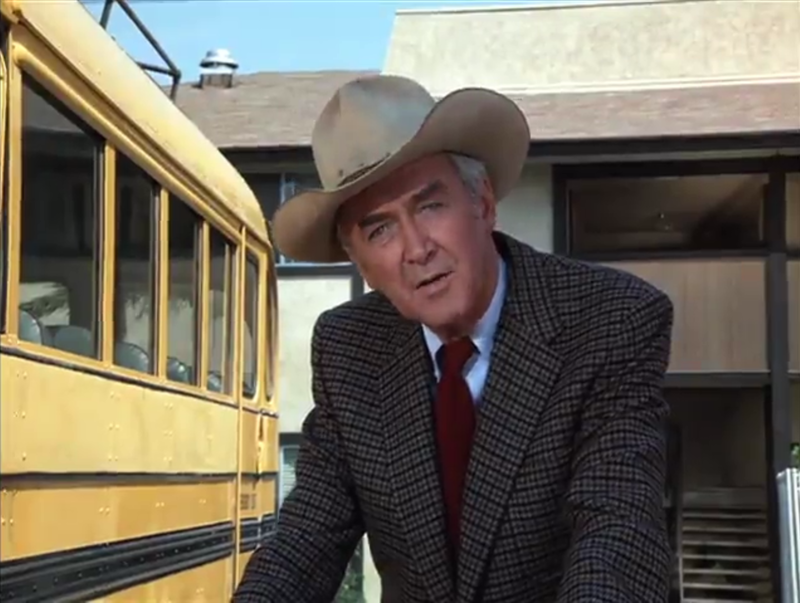 Yes, the show is hokey, but come on, it has Jimmy Stewart with all his 'Aw, shucks' likability! 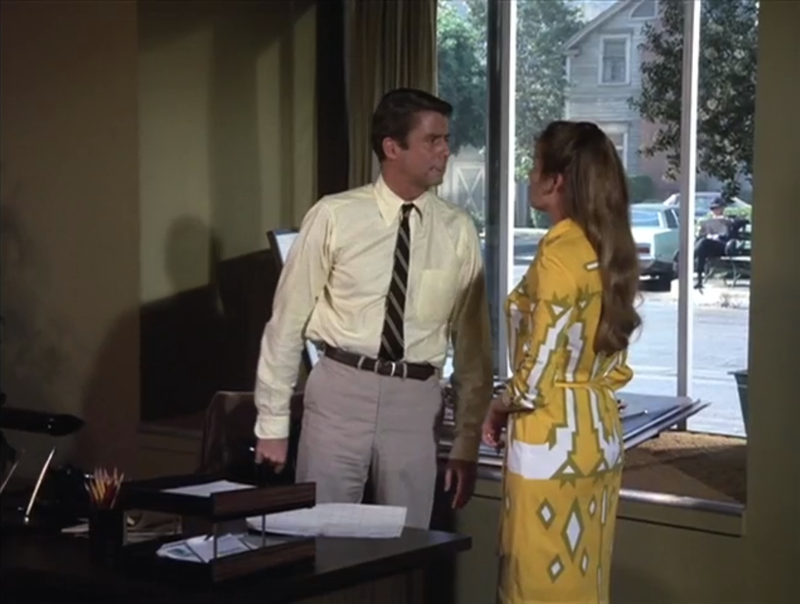 I could watch Stewart mumble the alphabet and find it amusing. And in addition to Stewart the cast includes the lovely Julie Adams, John McGiver, and a few guest stars including Beulah Bondi and Vincent Price. Stewart plays James K. Howard, an anthropology professor at the local university of a small fictional town. Things are fine in Howard's life until his oldest son moves back home bringing his own family after their house burns down. Howard's simple life suddenly becomes more crowded and complicated. 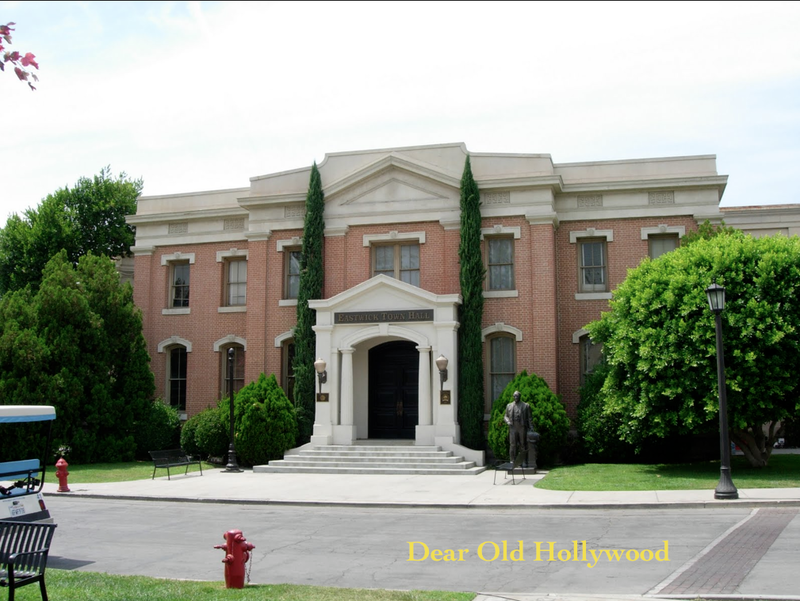 The show almost exclusively filmed on the Warner Bros. lot. 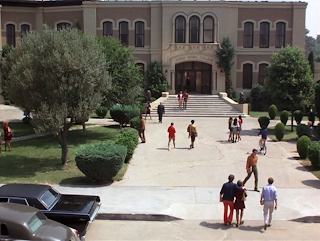 There are very few scenes that were filmed outside the studio. 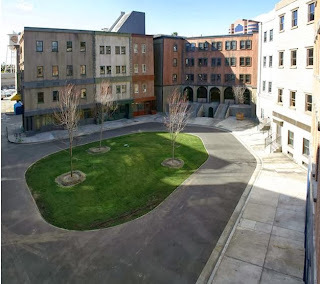 The center of town was the Midwest Street exterior set and the neighborhood was Residential Street/Kings Row which branches off of Midwest Street. Other exterior sets used include the Jungle/Lagoon set as well as an office building on the lot. 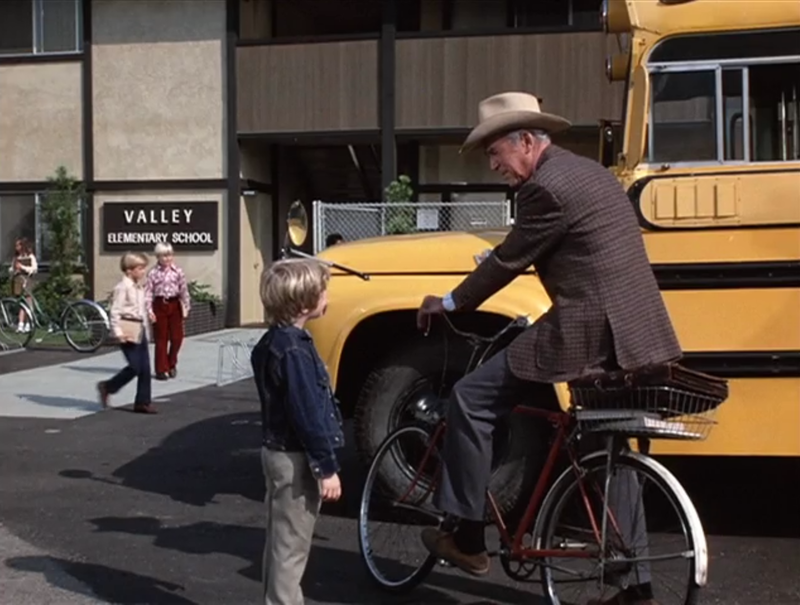 Stewart in front of "Valley Elementary School." Valley Elementary School. 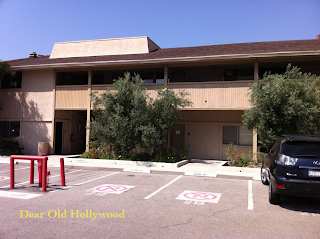 An office building on the WB lot. On the show, in addition to Stewart's older son, he and his wife have a young son that is just ten years old. The younger son attends Valley Elementary School which in reality is just an office building on the Warner lot located not far from the present location of the iconic studio water tower. Stewart talks with his son at Valley Elementary School. 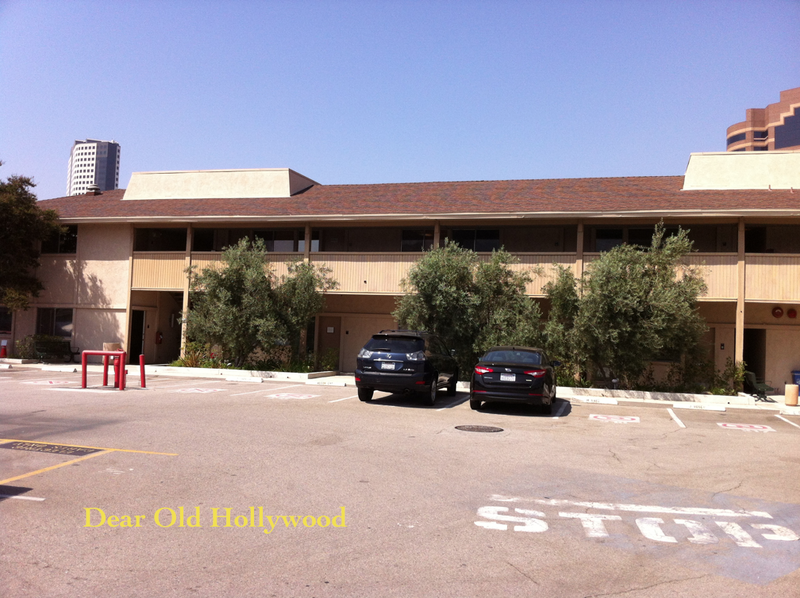 The office building on the Warner lot used for the elementary school set. 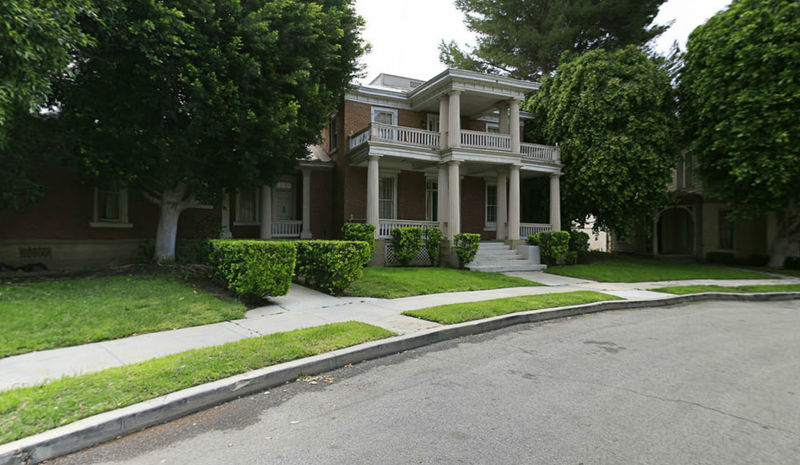 The Howard Family Home on Residential Street/Kings Row. 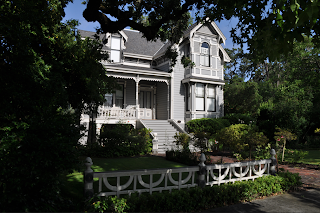 A contemporary view of the Howard Family home house. 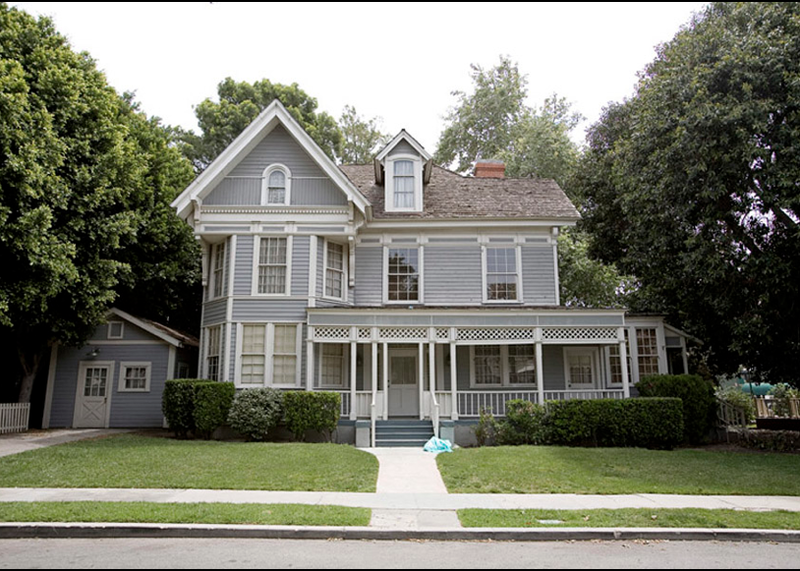 Above is a comparison of the Howard Family home which is one of the houses located on Warner's Residential Street. Below are views of a couple more homes located on Residential Street which can be seen on the show. 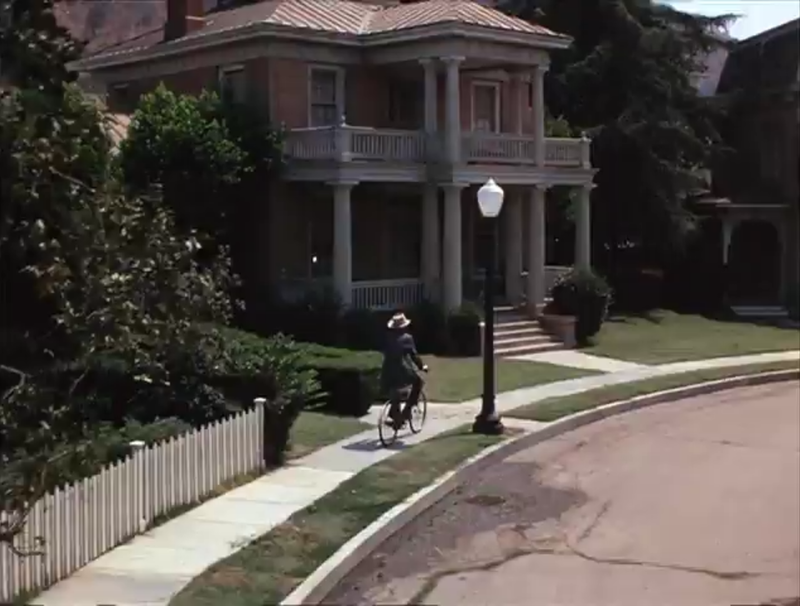 Stewart rides his bike down Residential Street. 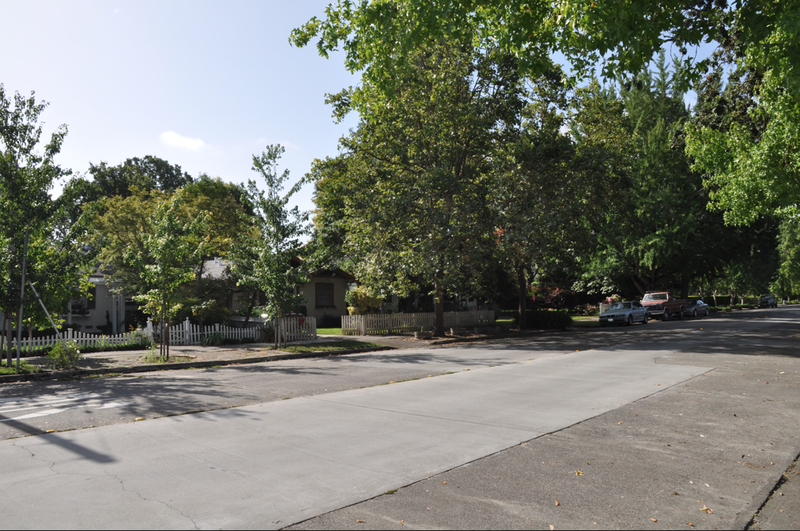 A contemporary view of Residential Street. The view from the Howard's front yard. 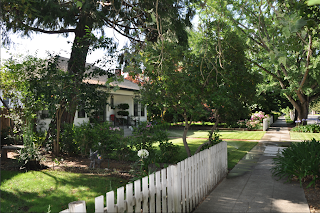 The same view on Residential Street. 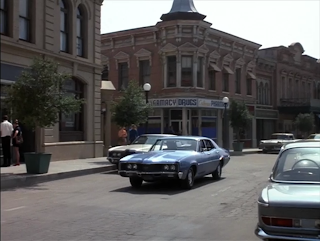 The next few comparisons feature the Midwest Street exterior sets. 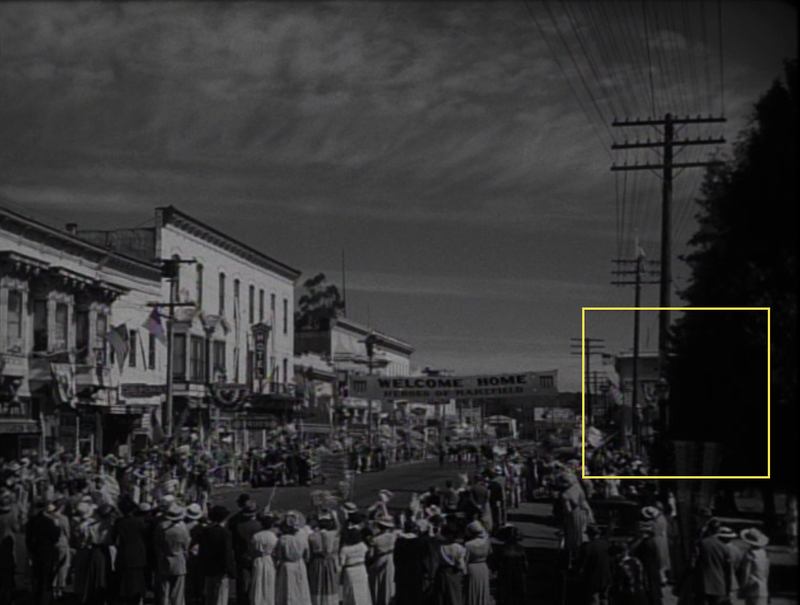 The center of Midwest Street as seen in The Jimmy Stewart Show. Contemporary view looking towards the center of Midwest Street. 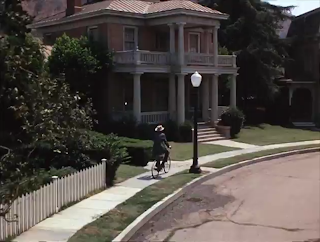 Stewart drives through Midwest Street. 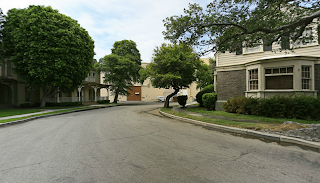 Midwest Street on the Warner Bros. lot. Stewart arrives at a Leather Goods shop. The Leather Goods facade as it appears now. 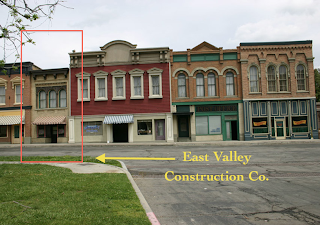 Stewart's older son works at the East Valley Construction Co. which is an exterior set located on Midwest Street. 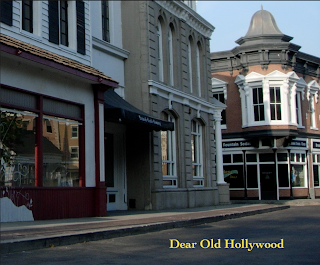 This facade and the one next to it actually look quite different from the way they did at the time of the show. 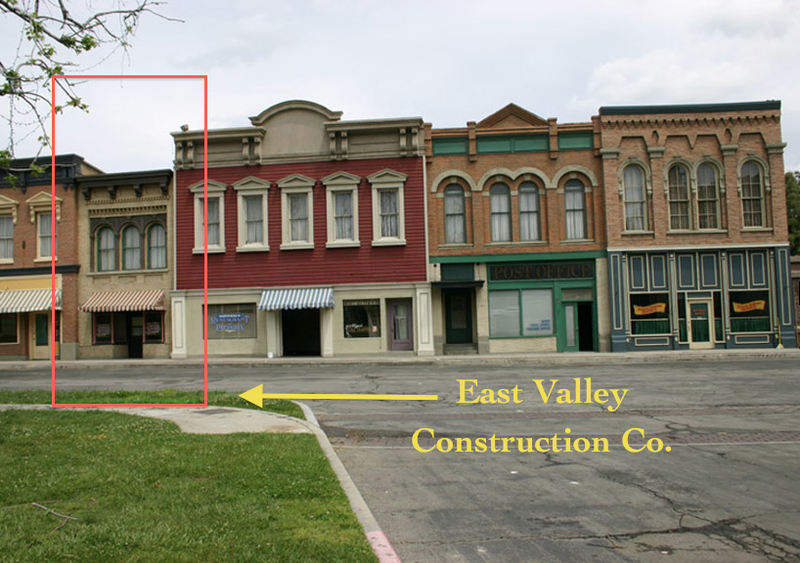 In the next few comparisons I've used a red rectangle to mark the building/sign for the East Valley Construction Co. site. Contemporary view of the East Valley Construction Co. facade. East Valley Construction can be seen in the background. 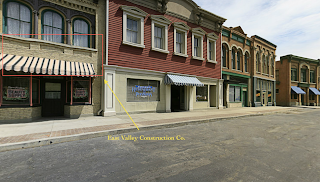 Looking along the facades that include East Valley Construction. 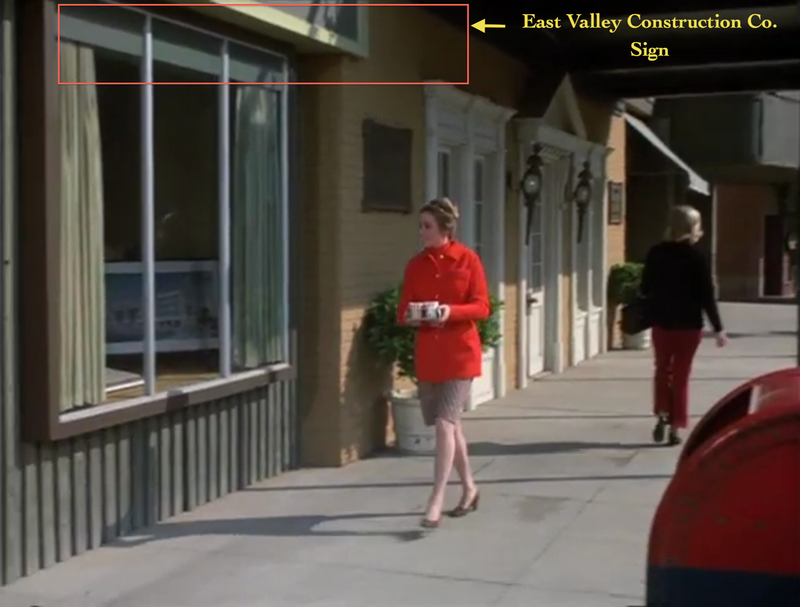 The East Valley Construction sign location is marked by the red rectangle. The next comparison shows the view looking inside out from the East Valley Construction facade. 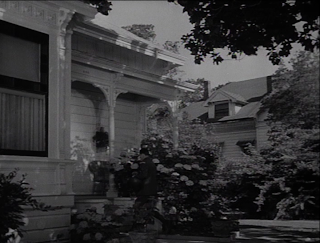 The same building that can be seen through the window can still be seen in the background today. Jonathon Daly and Ellen Geer inside the East Valley Construction set. The view looking from the East Valley Construction location. 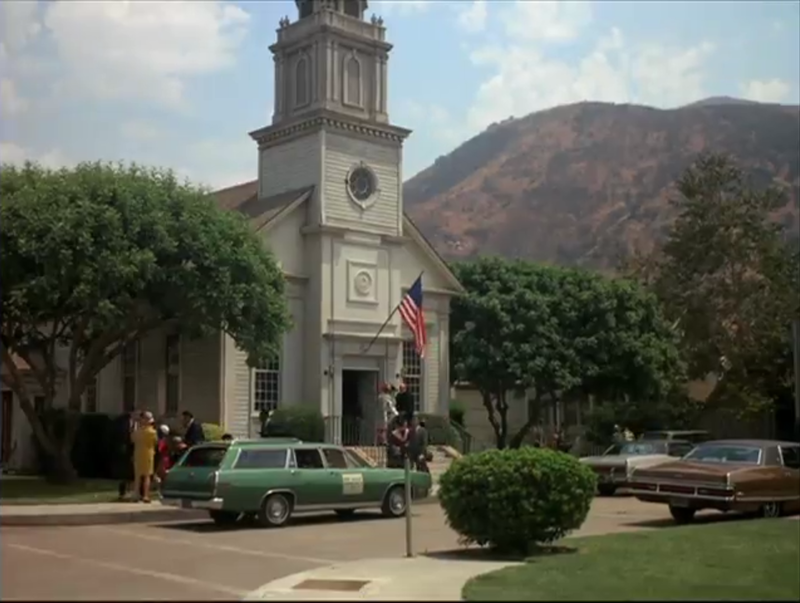 The Howard family arrives at church. A contemporary view of the church set. 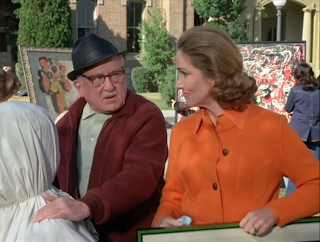 Julie Adams at an art contest. The City Hall facade can be seen in the background. A contemporary view of the Midwest Street City Hall facade. 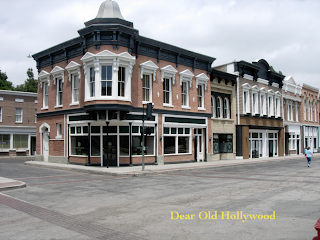 The comparison below is of of an exterior set that no longer exists on the Warner Bros. backlot. 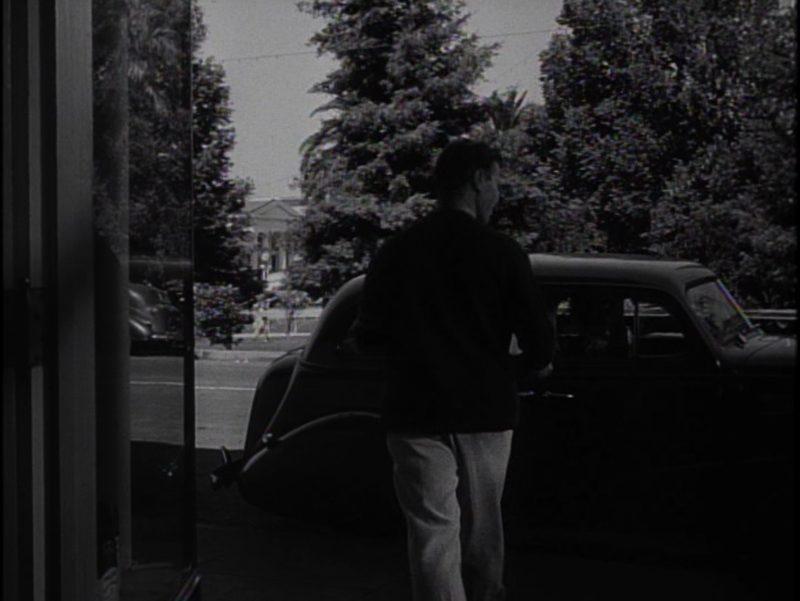 The first image is a screenshot from The Jimmy Stewart Show where the set is used as Josiah Kessel College. 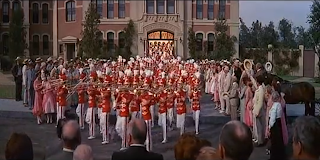 The second image is a screenshot from the film The Music Man (1962) which used the same set as a school in the fictional River City, Iowa. I'm keeping my eyes peeled now to see where else this set appears to see if I can pin point when this set disappeared from the lot. 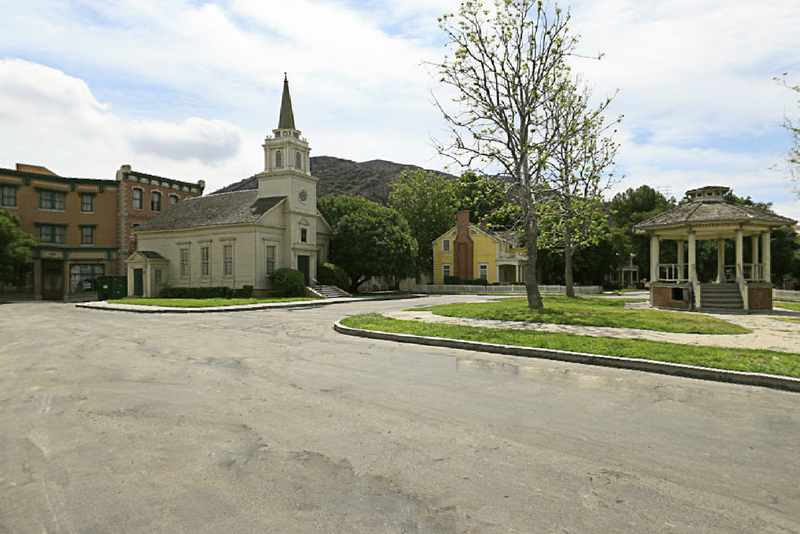 UPDATE (November 22, 2013) Thanks to Steve Bingen, one of the co-authors of the excellent book MGM: Hollywood's Greatest Backlot, I've learned that the set below used for the Josiah Kessel College was a backlot set known as "Hank's School" and was once located on the backside of the Hennesy Street set, where the Park Place set is located today. 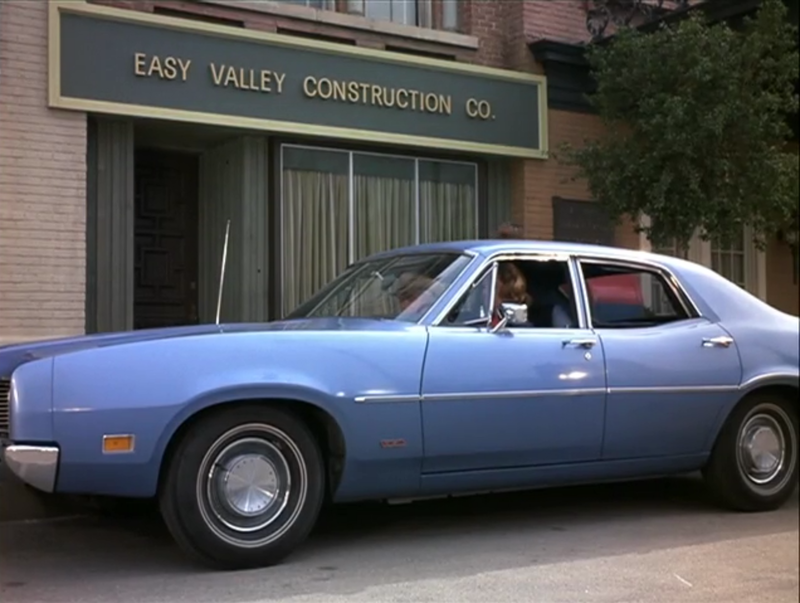 According to Steve, "Hank's School got its name from a TV series called Hank from the early 60s. 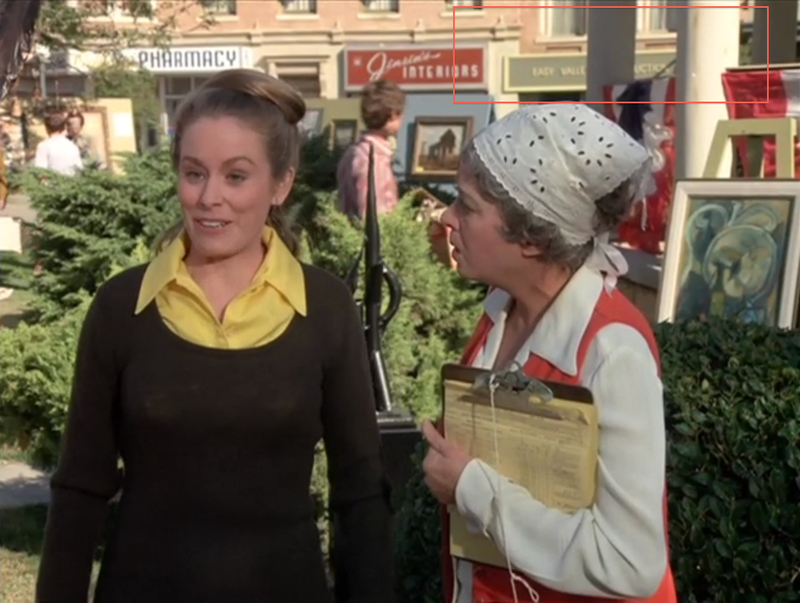 Although the set predated the show. 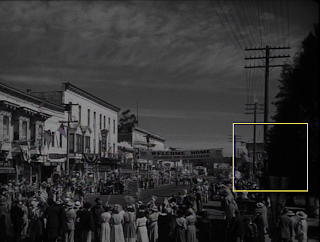 Village of the Giants is another film where its possible to get a good look at the set. It was also Boatwright University in The Waltons in the 70's. 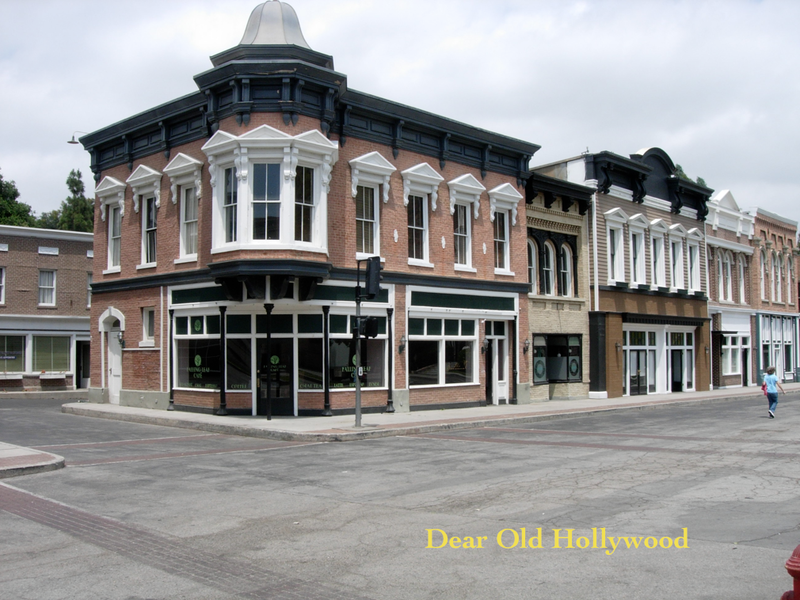 It was taken down in 1995 when Batman Forever did a rebuild of Hennesy Street." Josiah Kessel College in The Jimmy Stewart Show. A screenshot from The Music Man (1962). The Park Place set stands where the Josiah Kessel College/"Hank's School" set once stood. 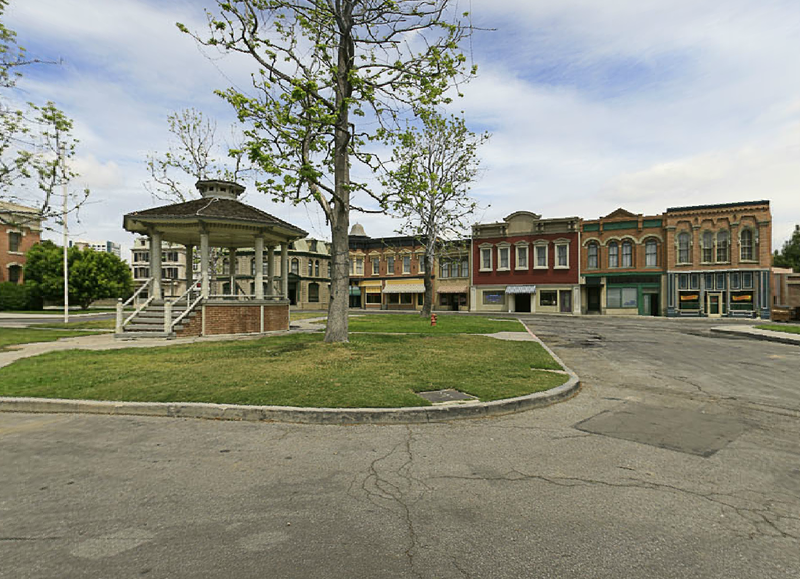 This last comparison is a view of the Jungle/Lagoon backlot set. In The Jimmy Stewart Show there is an episode where Stewart and his younger son are seen fishing from a pier. 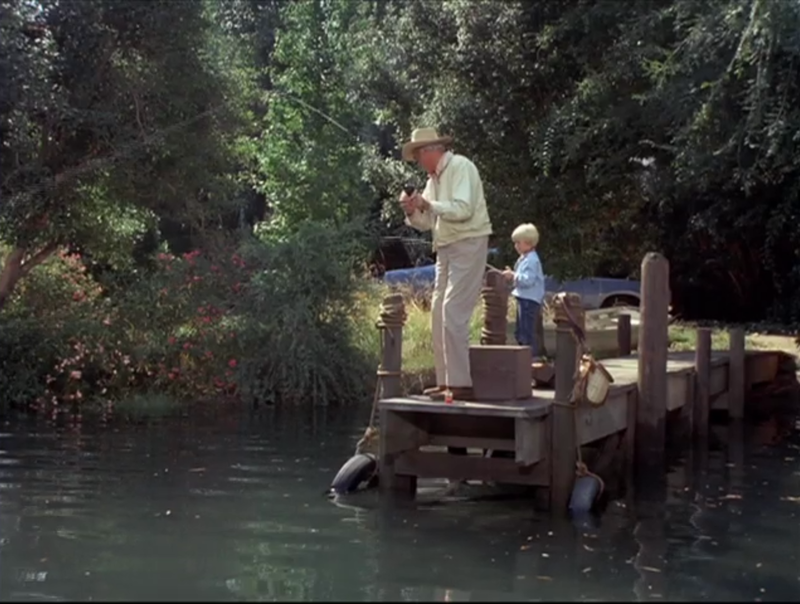 Stewart fishing with his son on the Warner backlot. 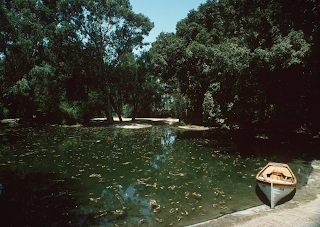 The Jungle/Lagoon set on the Warner Bros. backlot. 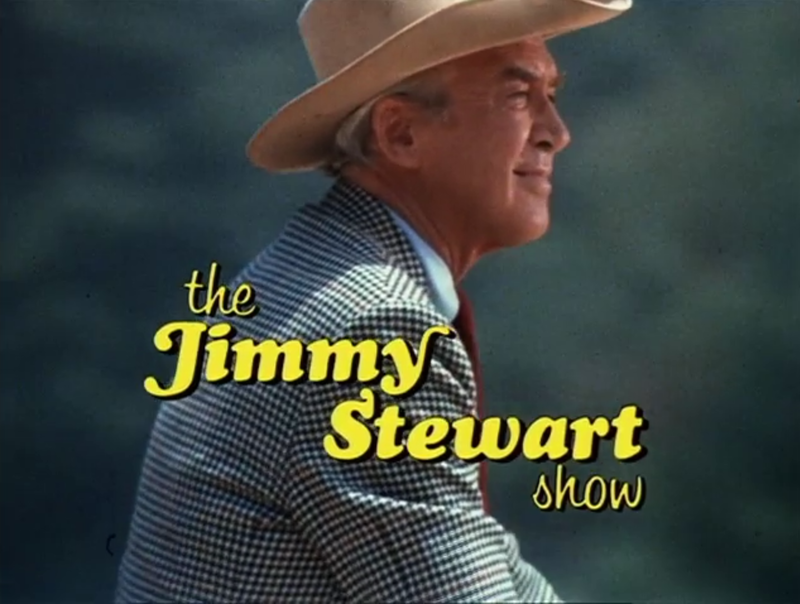 The Jimmy Stewart Show is not available on DVD but can currently be viewed on the Warner Archive Instant streaming service. 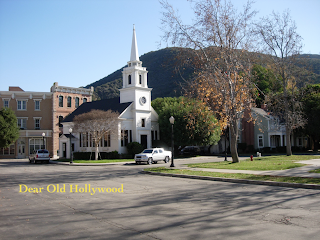 More Midwest Street/Residential Street on screen appearances covered here on Dear Old Hollywood include: The Hard Way (1943), East of Eden (1955), Rebel Without a Cause (1955), No Time For Sergeants (1958), The Music Man (1962), Suppose They Gave a War and Nobody Came? (1970), Nickelodeon (1976), The Monster Squad (1987). 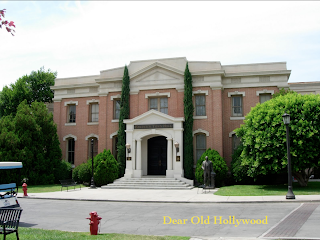 All images (c) Warner Bros. except where otherwise noted. Happy Land (1943) is a sentimental story about a father struggling with grief after learning that his only son was killed during World War II. The subject of the story is still relevant. Parents still struggle with the loss of their children due to fighting wars, but the way this particular story is told is a bit old-fashioned, what modern audiences may consider corny. Nevertheless, I enjoyed the sweetness of this film and its touching moments. 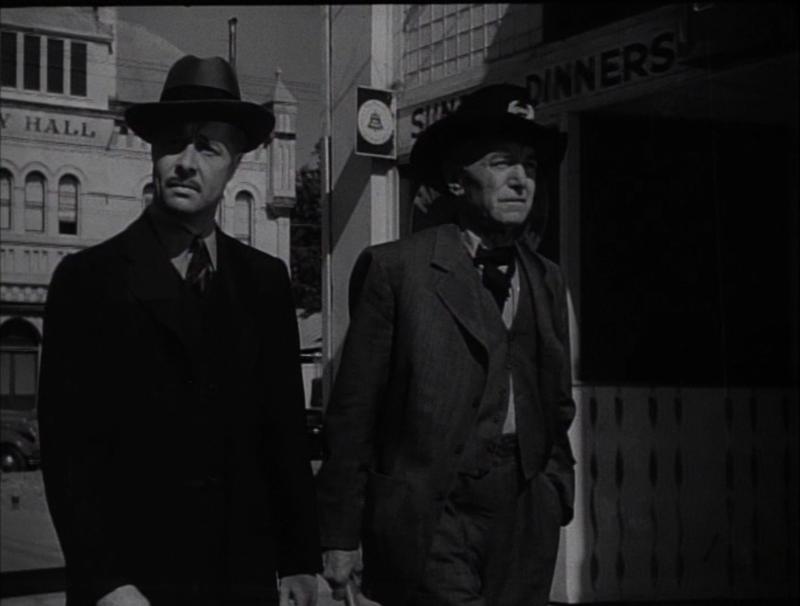 Don Ameche plays the father, Lew Marsh, a pharmacist in the small town of Hartfield, Iowa. One day while having lunch with his wife Agnes (Frances Dee), he receives a telegram that their son was killed in action. 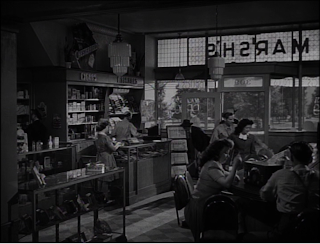 Marsh, overwhelmed with grief, stops talking with Agnes and neglects the pharmacy. Reverend Wood tries to comfort Lew with the idea that Rusty died for his country, but this doesn't comfort Lew at all, who feels his son Rusty never had a chance to live a full life. 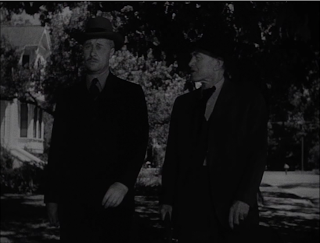 After the reverend leaves, Lew is visited by the spirit of his late grandfather, Edward "Gramp" Marsh (Harry Carey). Gramp accompanies Lew on a walk and in the process Gramp takes Lew on a walk back in time, recounting tender moments in the family's past. 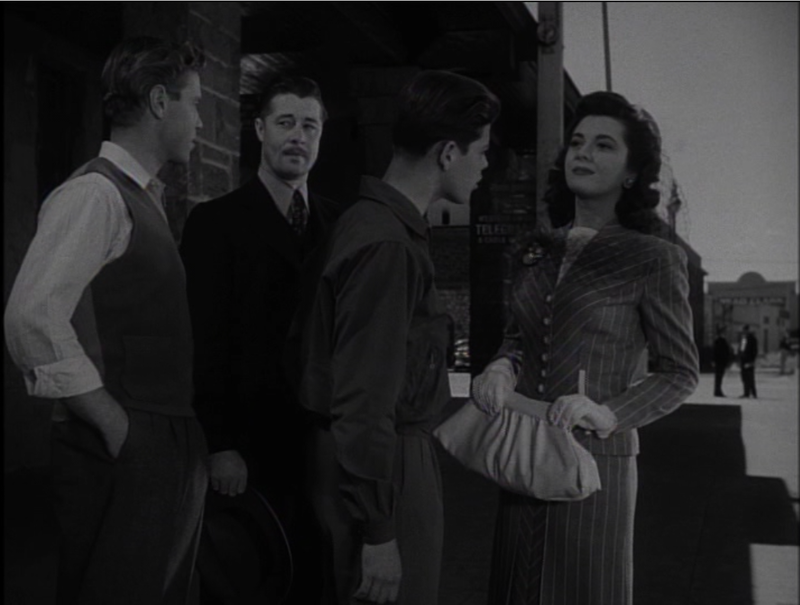 In addition to Ameche, Dee, and Carey, the cast also includes Ann Rutherford, Richard Crane, a young Harry Morgan of M.A.S.H. fame and a very young Natalie Wood in a blink and you'll miss her scene. 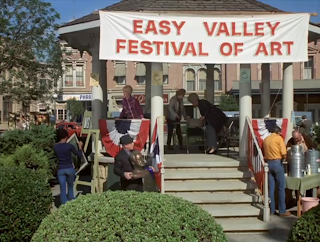 The story is set in the fictional town of Hartfield, Iowa. 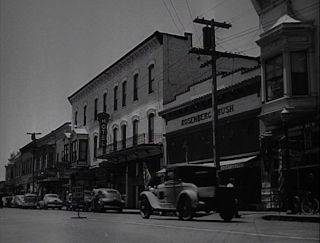 Location filming actually took place in the Northern California cities Healdsburg and Santa Rosa (where Hitchcock filmed the classic Shadow of Doubt during the same year). 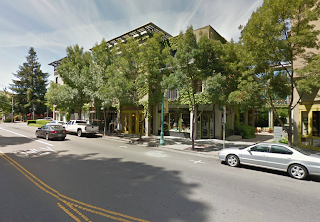 Looking down Healdsburg Ave towards Matheson St. The Healdsburg Plaza in the city of Healdsburg, California was used as the location for the fictional Hartfield center of town. The Marsh's pharmacy where Ameche's character works was located on Healdsburg Avenue between Matheson Street and Plaza Street. The old structures on this block, including the building that was used as the pharmacy location, have all been replaced by one large modern structure. 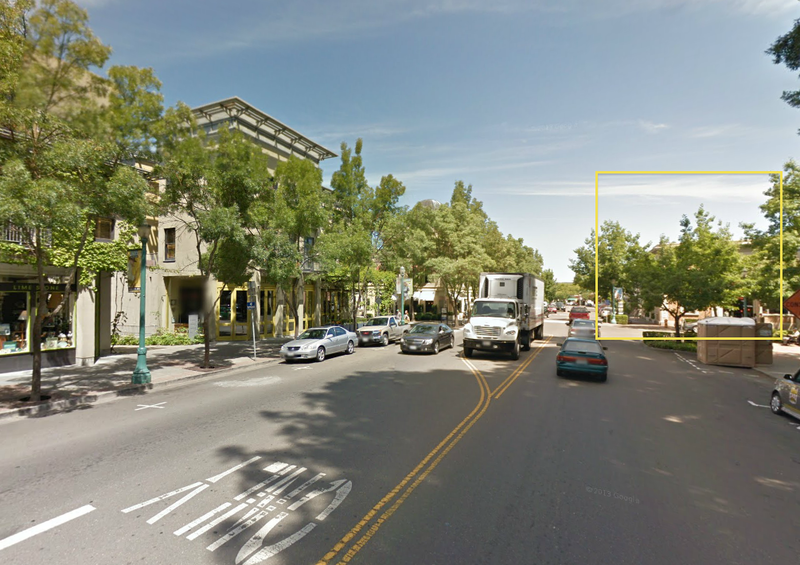 Above is a comparison of the view looking down Healdsburg Avenue towards Matheson Street as seen in the film compared to the contemporary view. 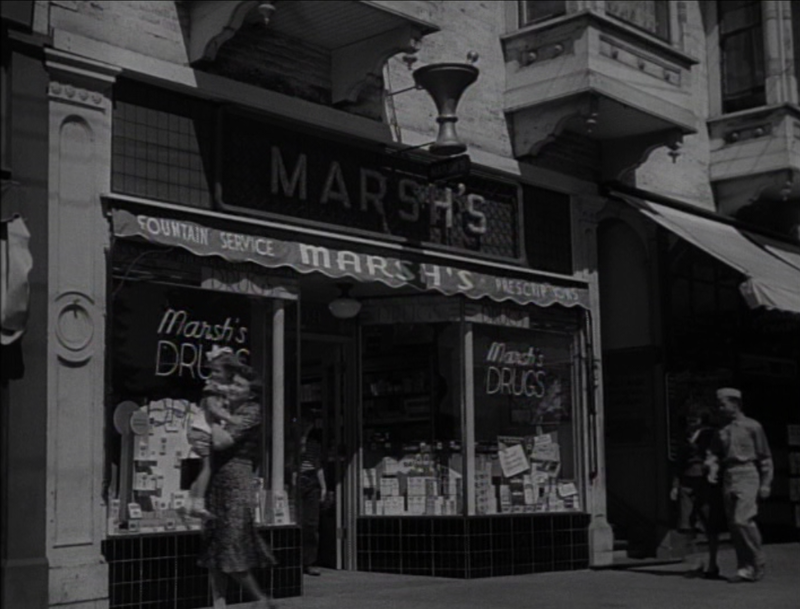 Below is a close up comparison of the Marsh's pharmacy site. 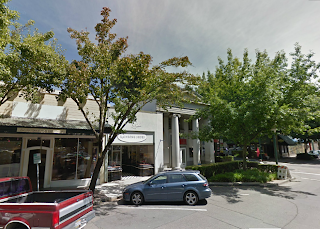 Marsh's pharmacy on Healdsburg Ave. The Marsh's pharmacy building has been replaced by this modern building. The interior of Marsh's pharmacy looking out towards Healdsburg Ave. 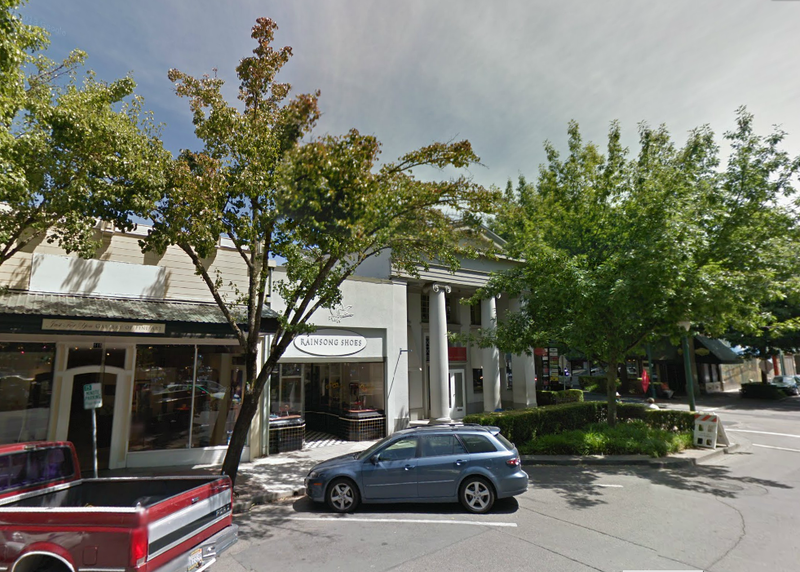 The next location is also on Healdsburg Avenue located between the pharmacy and the Healdsburg Plaza, looking in the direction of Plaza Street. 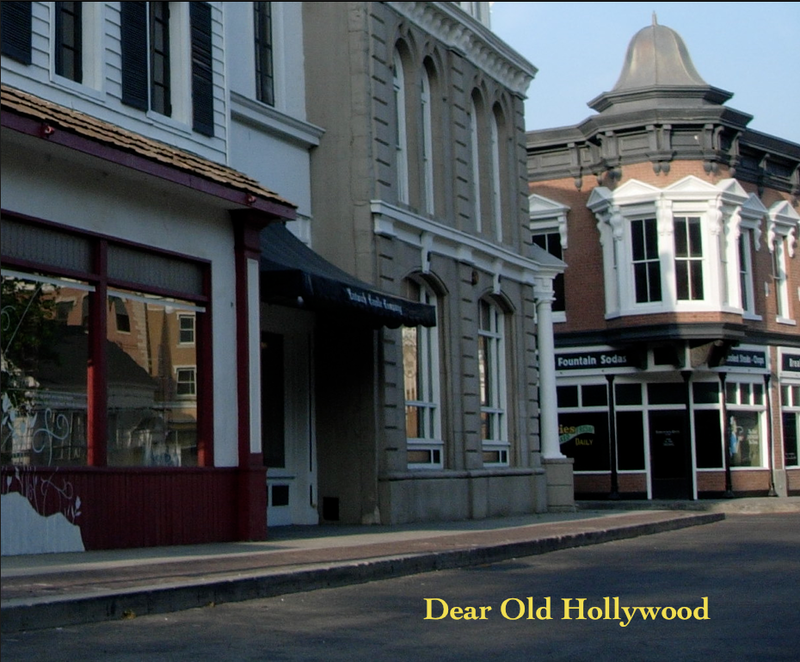 This scene is part of one of the flashback moments. 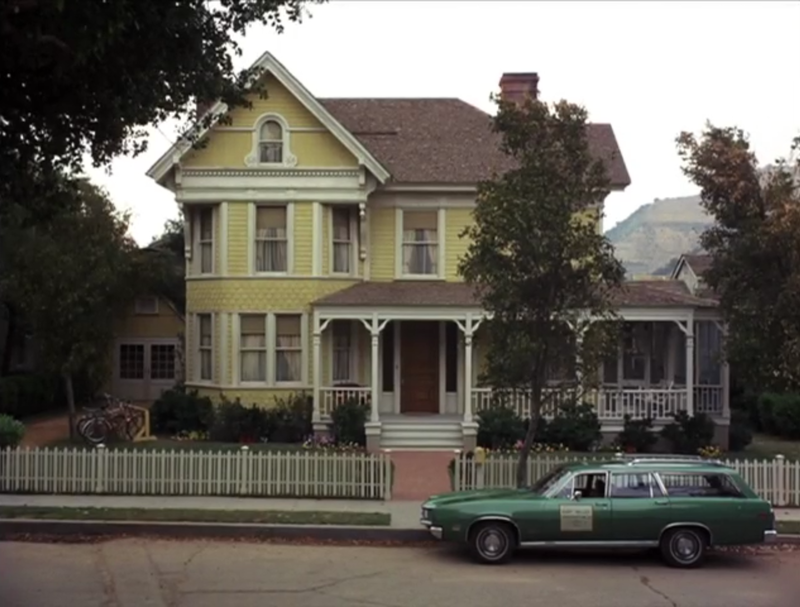 Although all the buildings on the left of the screenshot have been demolished, the building marked by the yellow square is still standing, however, in the contemporary view the building is hidden behind trees. Healdsburg Ave looking towards Plaza Street. 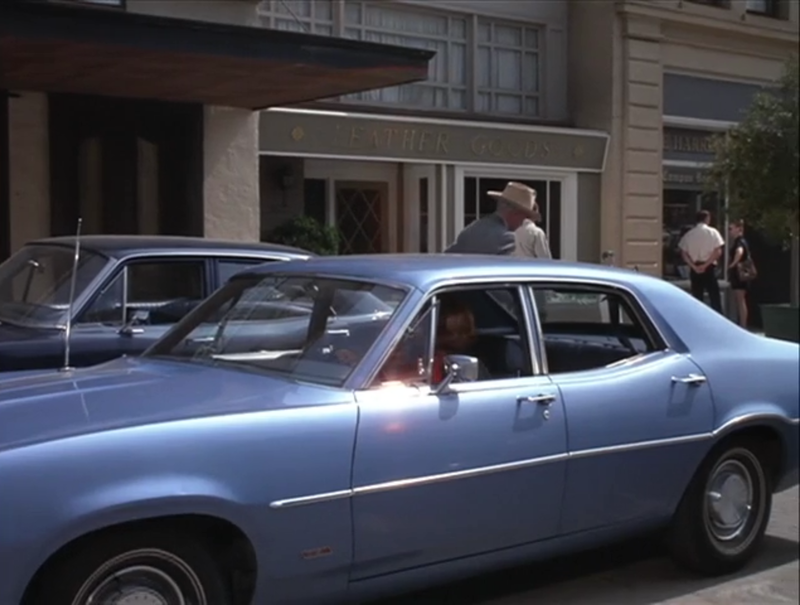 In the next scene below Ameche is seen walking with Harry Carey down Matheson Street with the old Healdsburg City Hall in the background. 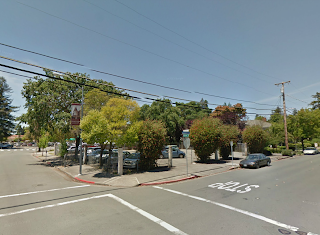 I recognized the City Hall location when I was searching through old photographs on the Sonoma County Library online catalog. That's how I discovered that the town scenes were filmed in Healdsburg and from this location I was able to then identify the other Healdsburg locations. 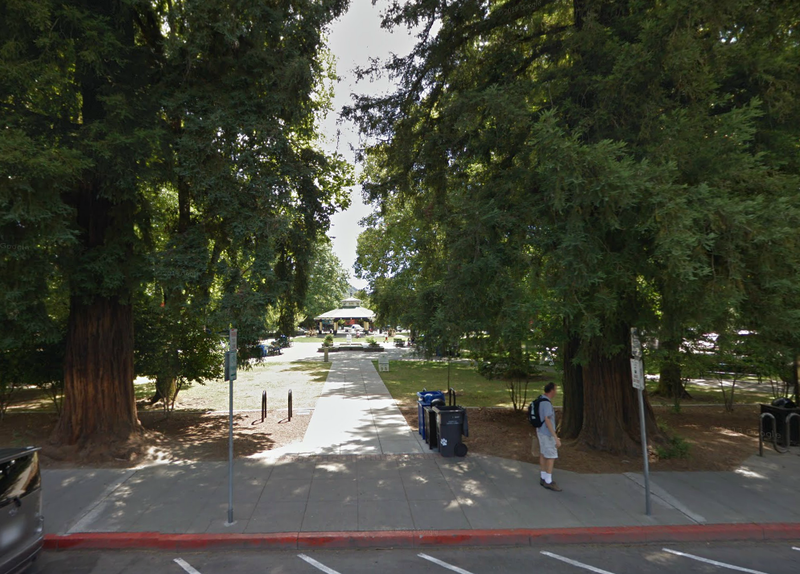 The old Healdsburg City Hall, which stood on the corner of Matheson Street and Center Street, was torn down in 1960. Presently an Oakville Grocery stands on the site. 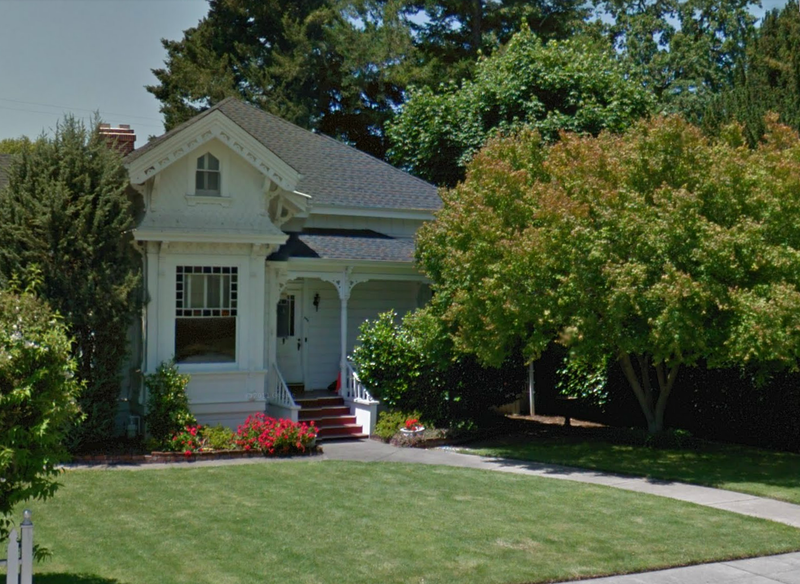 The Healdsburg Patch has an interesting article on the history of the old Healdsburg City Hall and contains a slide show of some old images of the building. Ameche and Carey walk pass the old Healdsburg City Hall. 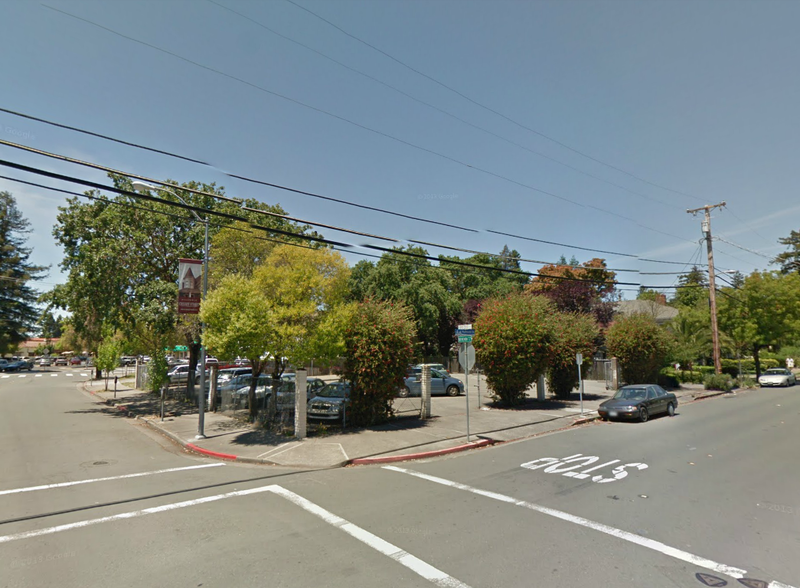 Looking towards the corner of Matheson and Center Streets where the old Healdsburg City Hall once stood. 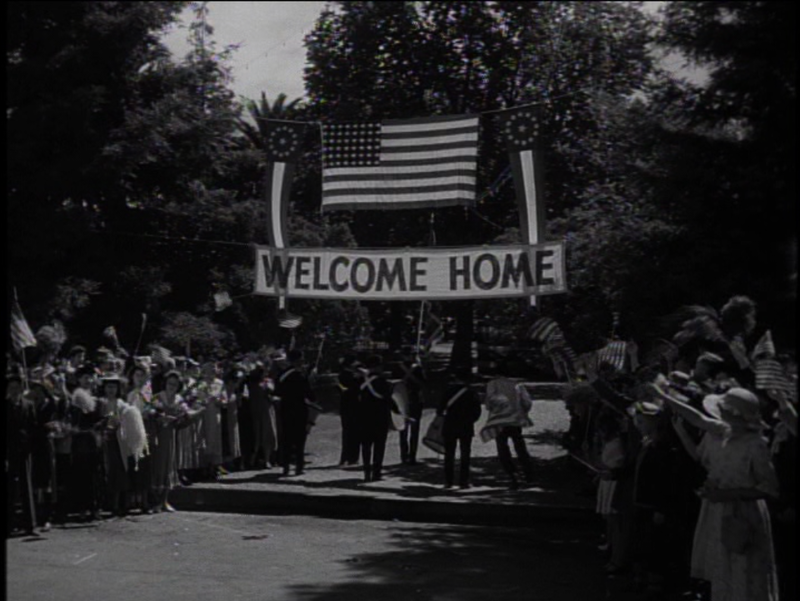 The next scene is of a World War I parade and spectacle taking place inside the Healdsburg Plaza. 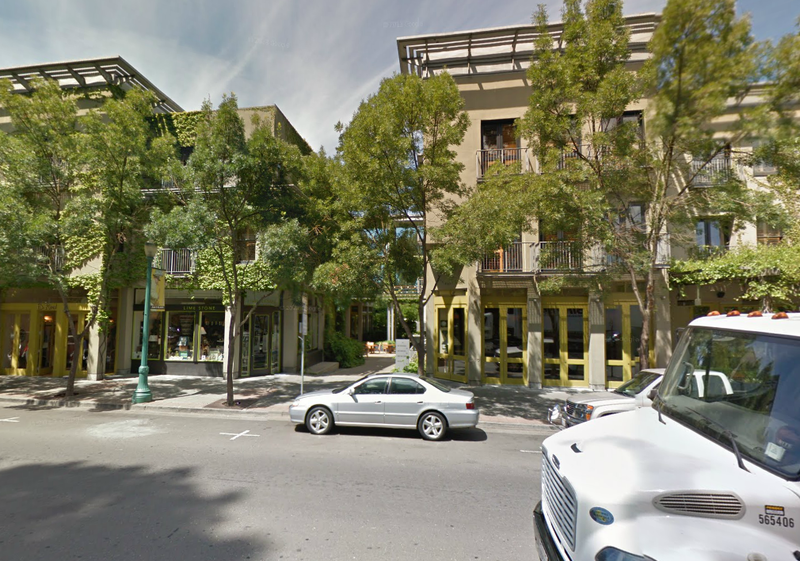 This view is looking into the plaza from across the Marsh's pharmacy location on Healdsburg Ave. 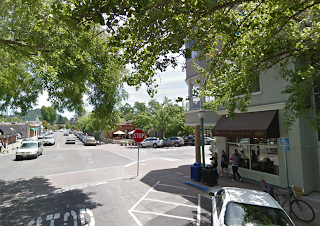 Looking into the Healdsburg Plaza. 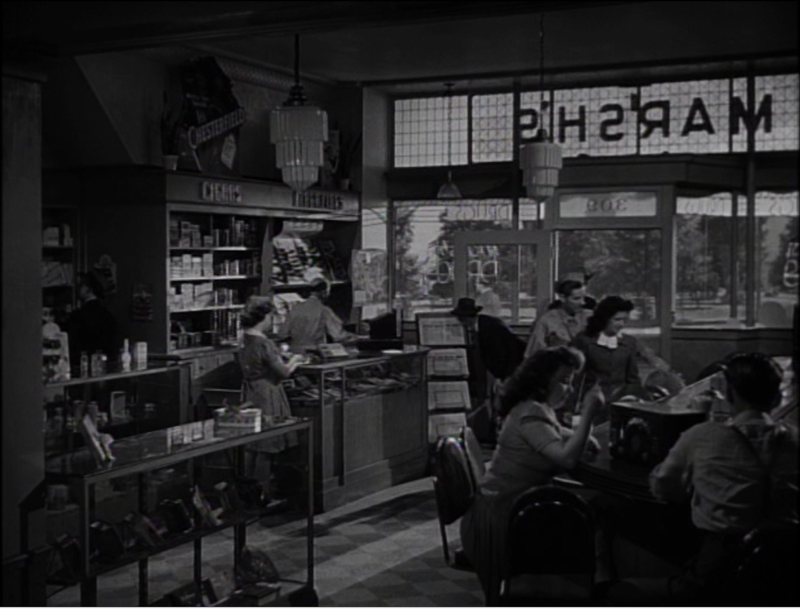 Below is another view looking out from the Marsh's pharmacy towards the plaza. In the screenshot we can see part of a building peeking out from behind the trees. 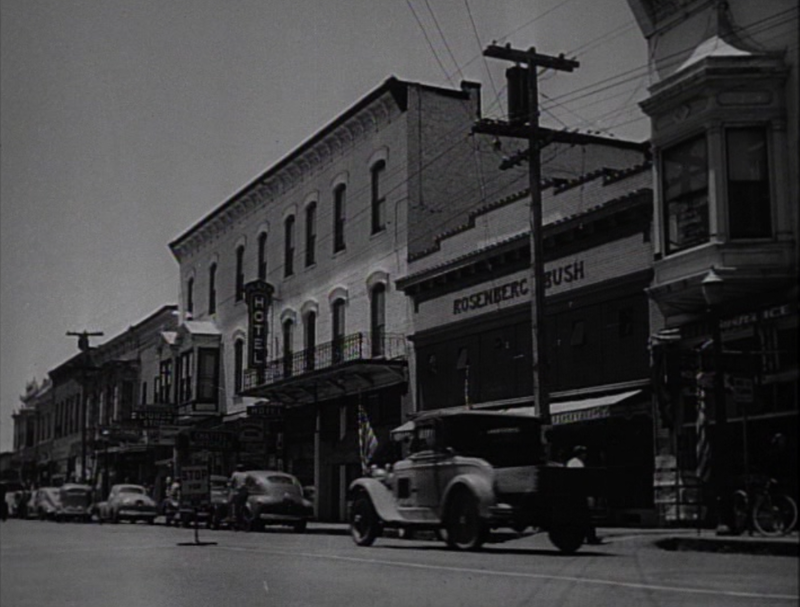 That building is still standing on Plaza Street and is currently the site of Gallery Lulo. The site of Gallery Lulo in background. Gallery Lulo on the corner of Plaza and Center Streets. Below is a postcard view looking down at the Healdsburg Plaza from above the old City Hall and Court House building and a contemporary Bing Bird's Eye view looking at the plaza. 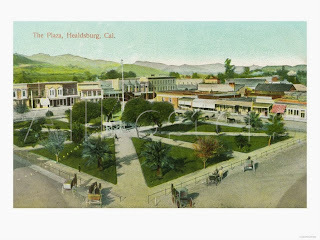 In the postcard you can see how the plaza used to look, including the buildings on the left which were used for the pharmacy location. 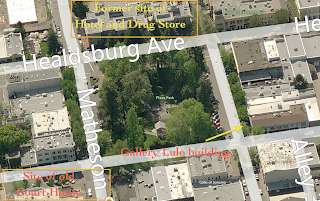 In the Bird's Eye View I've marked the location of the pharmacy, the Gallery Lulo building, and the old Court House/City Hall building. 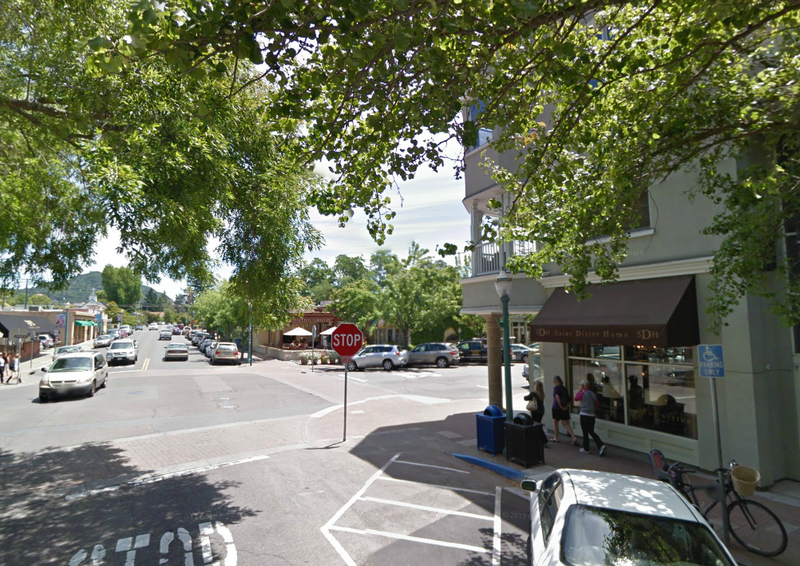 View of Healdsburg Plaza looking from old Court House. 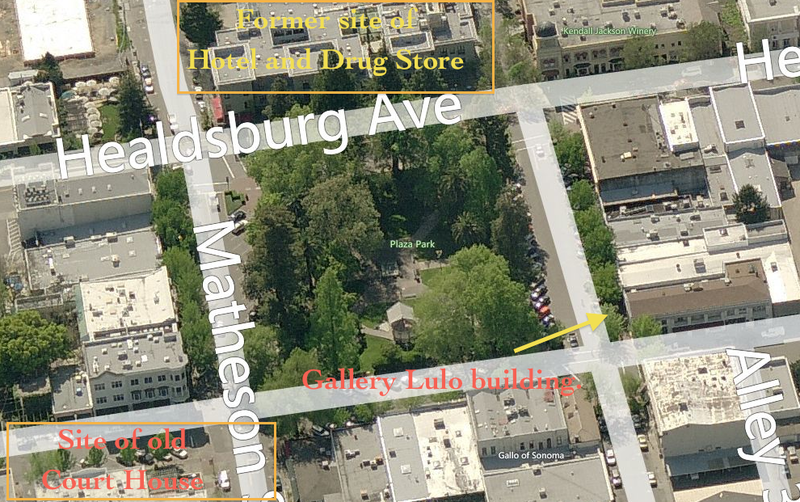 Bing Bird's Eye View of Healdsburg Plaza. 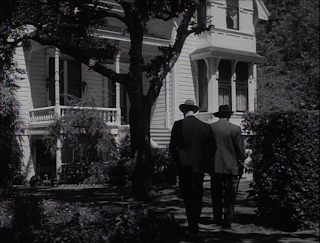 In the city of Santa Rosa, where Hitchcock filmed Shadow of Doubt the same year, two homes, a train depot, and a church were used as filming locations. 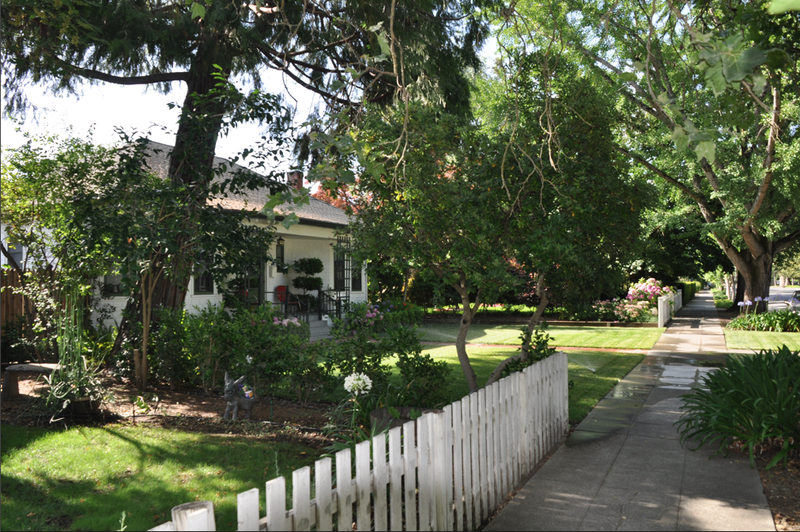 The main home where Ameche and Dee live is located on Santa Rosa's McDonald Avenue, specifically 1127 McDonald Avenue. 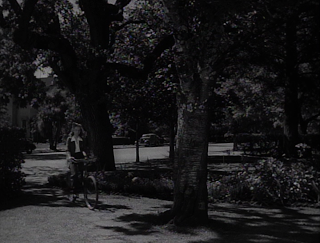 I knew that Happy Land had filmed in Santa Rosa, but I didn't know where the house may have been filmed. Where does one begin to look in a city? 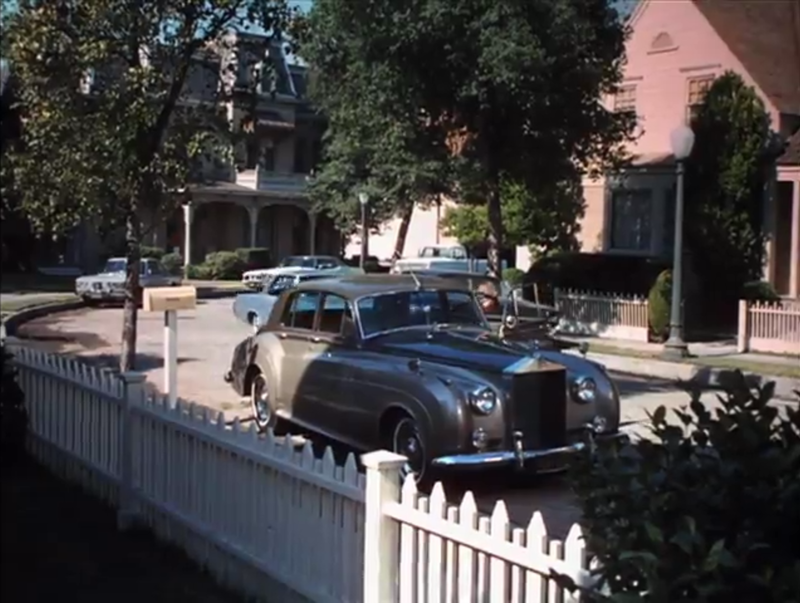 I figured if Hitchcock had filmed on McDonald Avenue then maybe so did Happy Land. 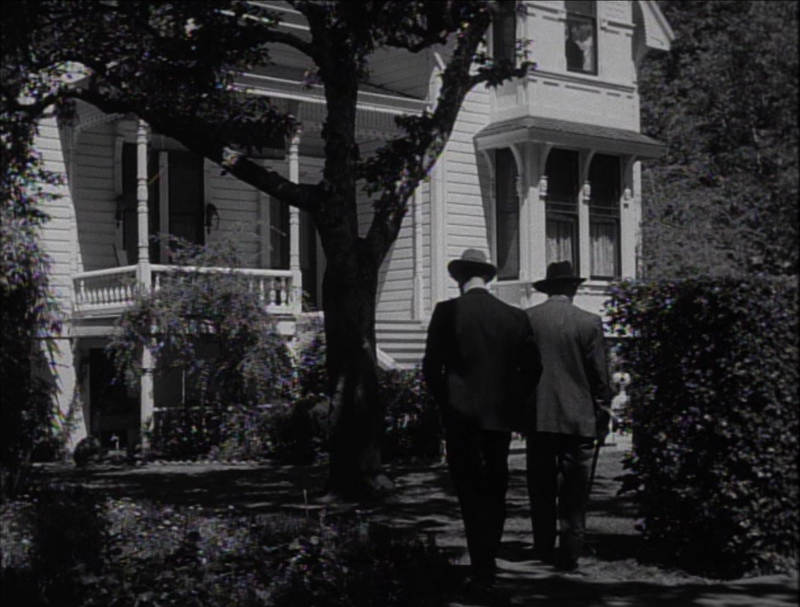 After a few minutes of searching homes on this street I fortunately was able to identify the house! Many homes in fact have filmed on McDonald Avenue. 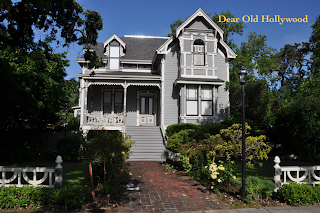 See my McDonald Avenue post for more on this street. 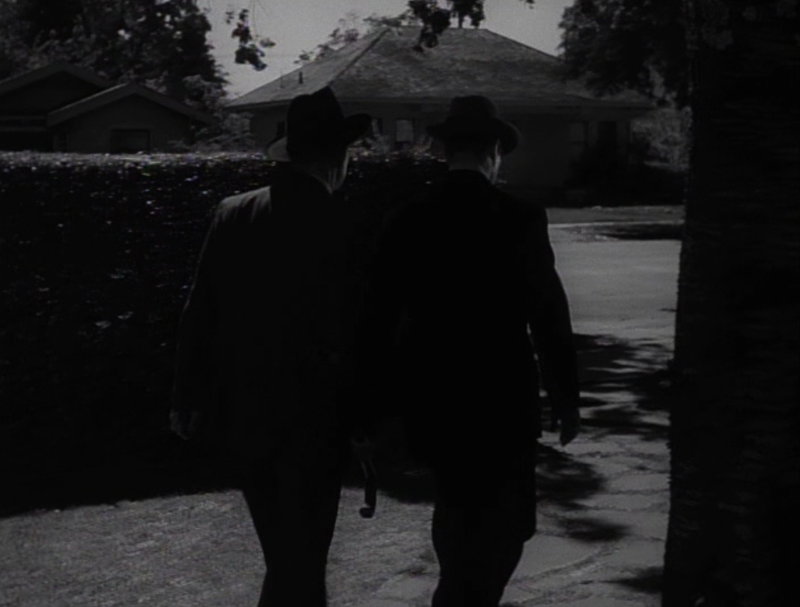 Ameche and Carey approach the family home at 1127 McDonald Ave.
Ameche and Carey leaving the home at 1127 McDonald Ave.
Another view of the home at 1127 McDonald Ave, Santa Rosa, CA. 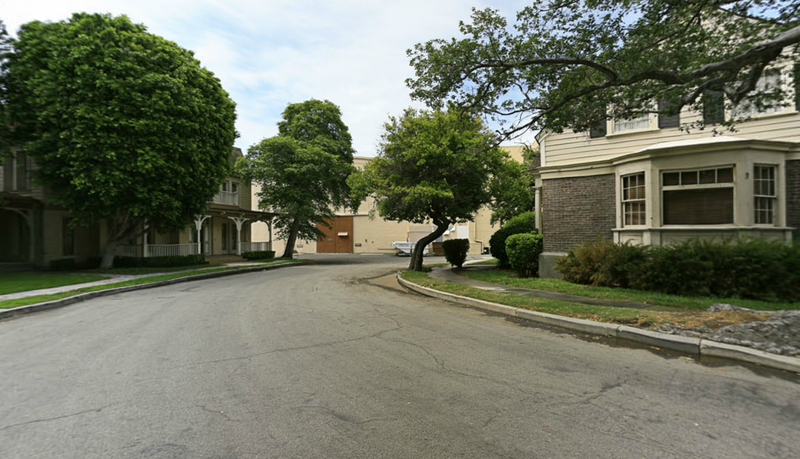 The screenshot below is a view looking across the street from the yard of 1127 McDonald Avenue. Looking across the street from 1127 McDonald Ave. 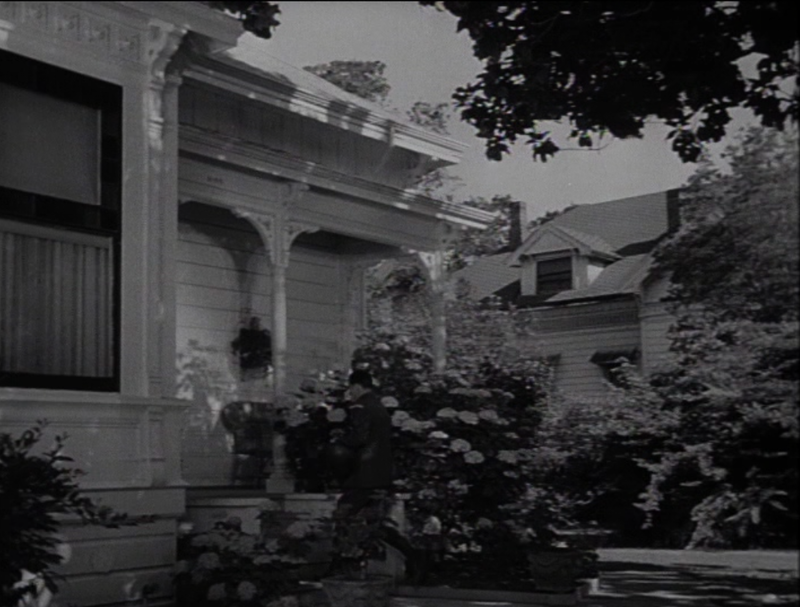 In the scene below we see Ameche and Carey pass a home on McDonald Ave across the street from the family home located at 1127 McDonald Ave.
Ameche and Carey walk down McDonald Ave. 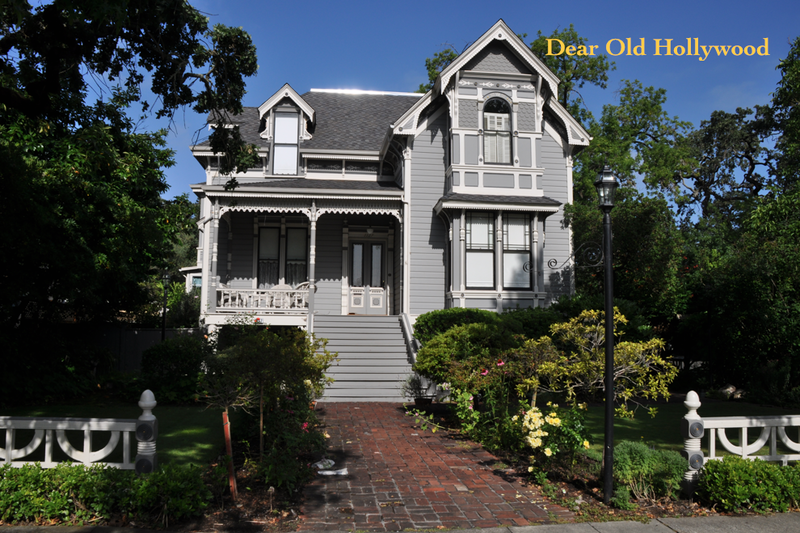 The same small house across the street is still recognizable. There is another home featured in Happy Land that is located on McDonald Avenue that I didn't cover in my earlier post about McDonald Avenue, and that is the house below which is used in one of the flashback scenes when Ameche is supposed to be a teenager. This house is located at 805 McDonald Ave, just a few blocks down the street from the other home. 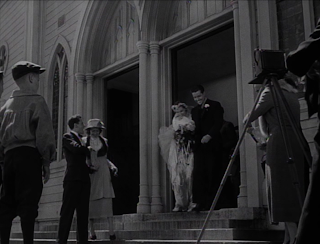 In another flashback scene we see Ameche and Dee leaving a church after being married. I was able to identify the church as the First Presbyterian Church from an historical photograph in the Sonoma County Library collection. 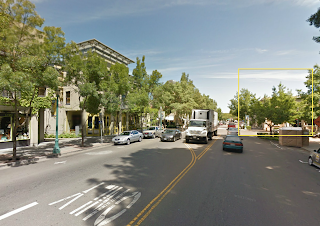 The street address on file was listed as Johnson at Humboldt. I couldn't locate a Johnson Street, but from further digging I learned from the Santa Rosa Seventh Day Adventist website that the Adventist church acquired the building from the Presbyterian Church and that Johnson Street is now "Seventh" Street. 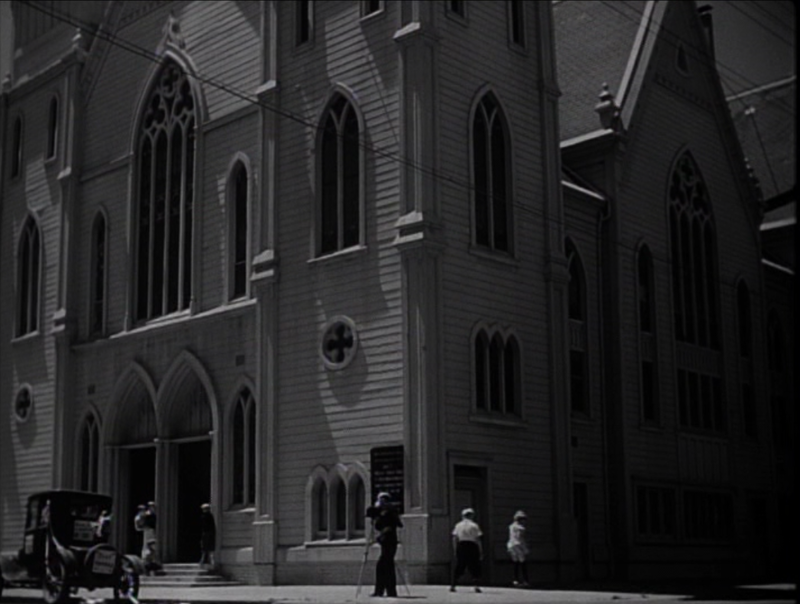 The church stood at the corner of Seventh and Humboldt until 1957, when the city decided the building was an earthquake danger to the public and asked that the church be torn down. The site is now a parking lot for the Press Democrat. Ameche and Dee leave the First Presbyterian Church. 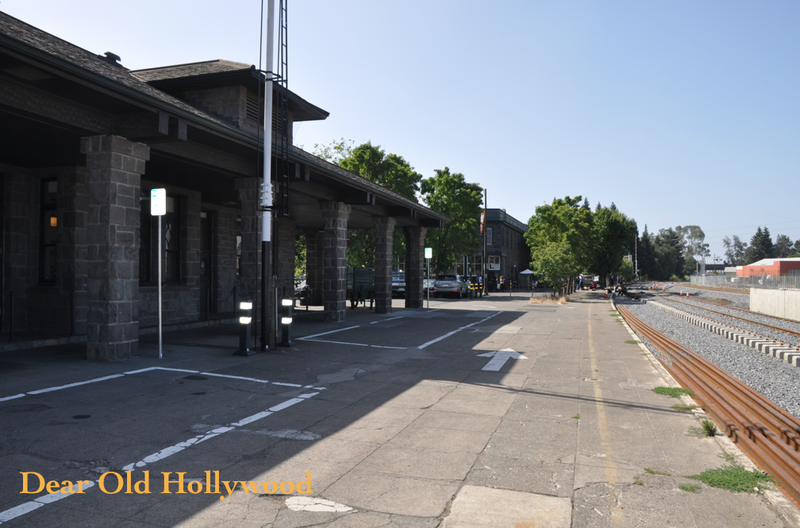 This final location is the Santa Rosa Train Depot. In the film, Ameche and Richard Crane see Dee off at what is supposed to be the Hartfield, Iowa railroad station. 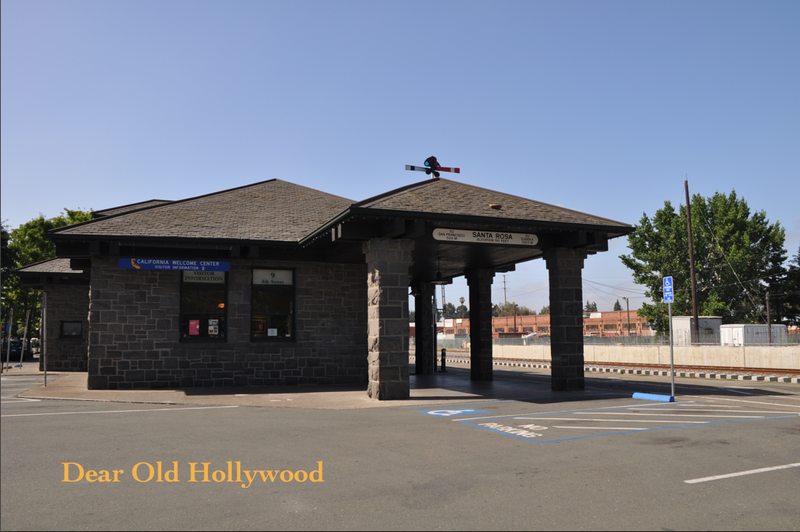 This historic train depot has been used a few times for films, most famously in Hitchcock's Shadow of a Doubt. 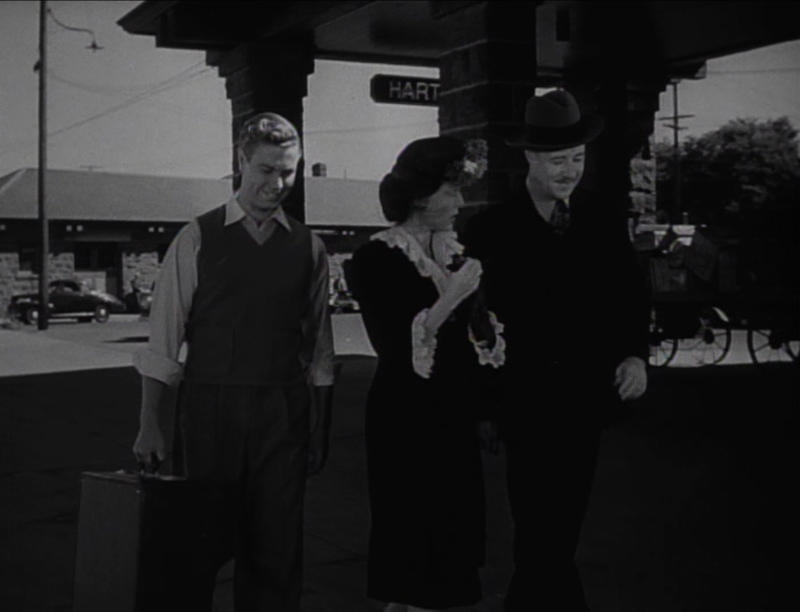 Crane, Dee and Ameche arrive at the Santa Rosa train depot. Looking at the train depot in July 2013. 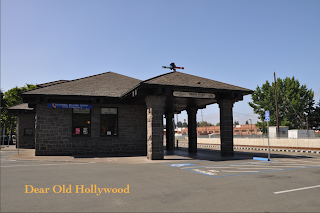 Another view of the train depot from Happy Land. 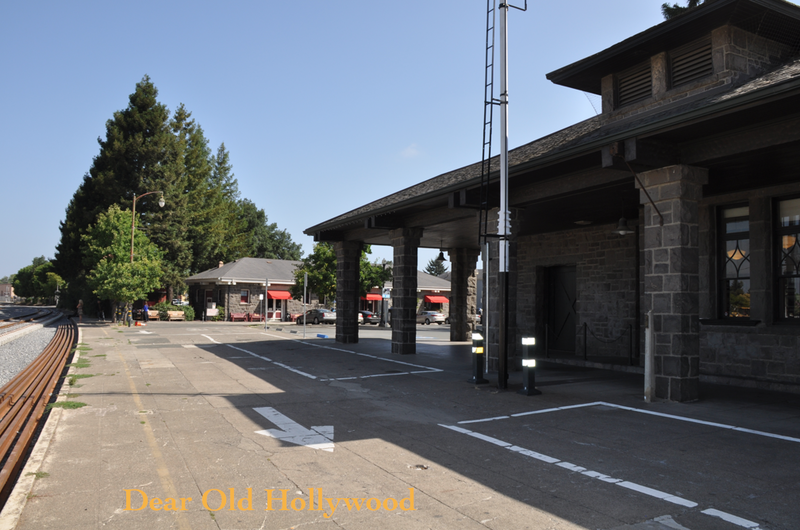 The same view of the train depot in July 2013. 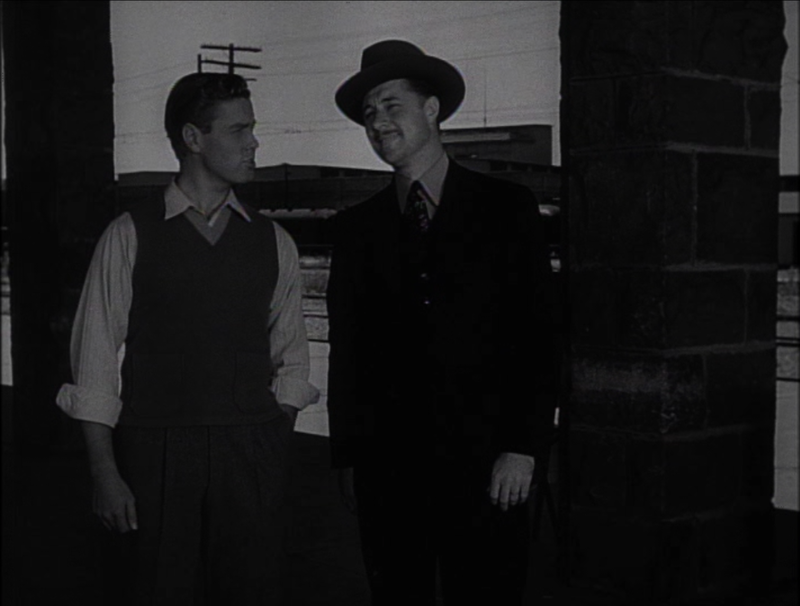 Ameche and Crane leaving the Hartfield train stop. The Santa Rosa, CA train depot. 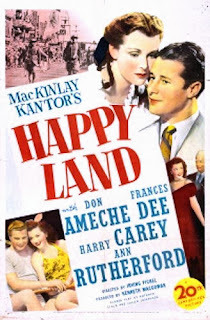 Happy Land is available on DVD and also available for rent exclusively through ClassicFlix. 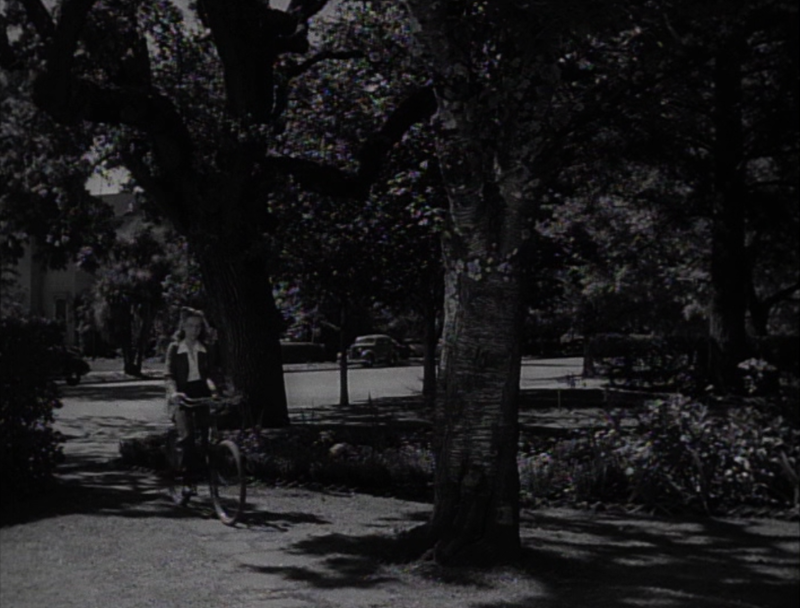 If you like simple, old-fashioned melodramas, I recommend this film.